MTN Uganda's Chief Marketing Officer; Olivier Prentout speaking during the launch of Kwese Iflix Platform in Uganda on Tuesday 12th, June 2018 at The Square Palace in Kampala, Uganda. Two MTN Uganda senior staff who happen to be foreign nationals, Olivier Prentout, and Annie Bilenge Tabura have been accessed for their alleged involvement in acts of comprising Uganda’s national security, according to a Police statement released Monday morning. Stating that they were working with a leading ‘Mobile Telecom Company’ but didn’t disclose which one—but clearly the two listed names were MTN Uganda’s staff. “We strongly believe that the deportation of the two Foreign Nationals, who were using their employment as tools to achieve their ill motives, has enabled us to disrupt their intended plans of compromising our National Security,” reads the statement. 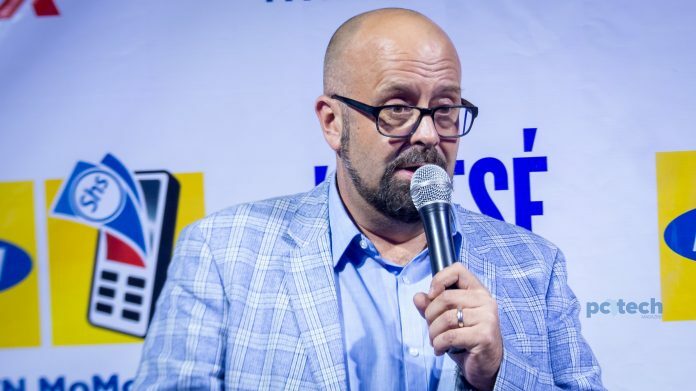 Olivier Prentout, MTN Uganda’s Chief Marketing Officer and Annie Bilenge Tabura, MTN Uganda’s Head of Sales and Distribution—have been deported to their home countries, France and Rwanda respectively. MTN Uganda released a statement on Tuesday morning, stating that Olivier was arrested on 19th Jan. 2019 by police at Entebbe International Airport upon arrival from a business trip abroad—while Tabura, was arrested by unidentified security personnel upon arrival at the MTN headquarter offices, in Kololo, Kampala—on Monday morning. However, it remains unclear on how the two staff members intended to compromise the country’s national security. Notably, if we recall—security official at the Internal Security Organization (ISO), raided MTN Uganda’s data centre claiming that the telco had breached the country’s national security. However, the telco dismissed the claims as untrue.